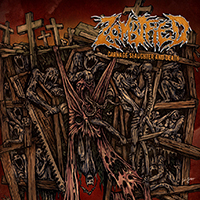 Not inventing any wheels, this one, the second album by Zombified from Sweden, but I can't help loving it anyway. It has a special touch that makes 'Carnage Slaughter and Death' raise its ugly head one notch over the big mass of old school death metal combos out there. If you listen to a song like Withering Souls, you'll know exactly what I'm talking about. It has a massive groove, heads down brutality along with a tiny, tiny element of punk rawness which gives the whole thing a tint of rebellion. For the most part, the Swedes head on full throttle, and this makes it all the more impressive when they break down into half-time. This, in fact, is the very centre of why I like this album: Zombified use the half-time with perfection to break the potential monotony of straight-ahead thrash-inspired death metal. Check it out if you're a fan of death metal with old school Swedish sound and want a sliiightly different twist.